As we head towards Nashville and the final leg of this year’s Standard format before rotation, one of the most hyped decks as we get into the BREAKthrough-Celestial Storm format is undoubtedly Turbo Rayquaza GX. Takuya Yoneda won the Japan Championships in June with the deck and it’s the signature card of the new set, so players will definitely want to try it out. This article is structured in three distinct parts. In part one, I go over the key cards of the Rayquaza GX deck and then three lists I’ve made for the deck. In the second part I go over some issues of concern I have for the deck. In the third part I look at a potentially better way to play Rayquaza GX beyond the turbo build. Rayquaza GX is the primary attacker and the card the deck is built around. Dragon Break does 30 damage times the amount of basic Grass/Lightning Energy you have in play. Typically you will want to have at least six Energy in play, as this allows you to hit for 210 damage with a Choice Band, which gets you the damage amount you need to knockout popular Pokemon like Buzzwole GX and Zoroark GX. Rayquaza helps itself get powered up with its Stormy Winds Ability, which has you discard the top three cards of your deck when you play Rayquaza GX from your hand onto your bench and then you attach a basic Energy card from your discard pile to it. Something important to note is that the Energy card you attach doesn’t have to be one of the three cards that you discard, it can be an Energy that is already in the discard pile from before you used Stormy Winds. With a successful use of Stormy Winds and a manual attachment, you’re already 2/3 of the way there for getting the necessary Energy to use Dragon Break. Max Elixir can be used to get the third Energy onto your Rayquaza GX to attack with it. 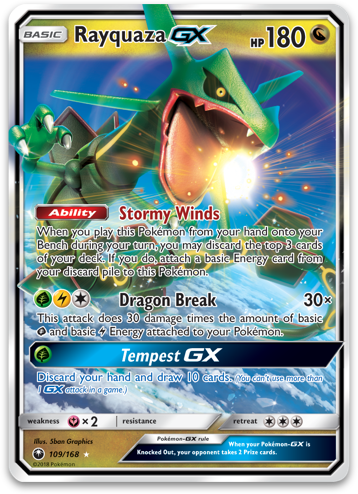 Tempest GX is a good option that Rayquaza GX can fallback on to get out of a dead hand and avoid losing a game solely to dead drawing. You don’t usually want to use Tempest GX in a game, as you have better GX attacks at your disposal and will want to be hitting your opponent with damaging attacks as soon as you can anyhow. One last note, is that in your Rayquaza GX deck, you don’t want to go too streamlined around Rayquaza GX like we’ve done in the past in things like Darkrai EX in 2012-2013 period. Ideally you will start something other than Rayquaza GX (and ideally that’s also not Tapu Lele GX), because when you start Rayquaza GX, that’s just one of your Stormy Winds Abilities that you won’t have access to. This combines with Stormy Winds as the primary Energy acceleration engine of the deck. This helps you not only get the 3rd Energy onto a Rayquaza GX to use Dragon Break, but also to get Energy into play in general to boost the damage output of Dragon Break. Latias provides some additional Energy acceleration while also doing 30 damage, which can help setup easier knockouts for Rayquaza GX. 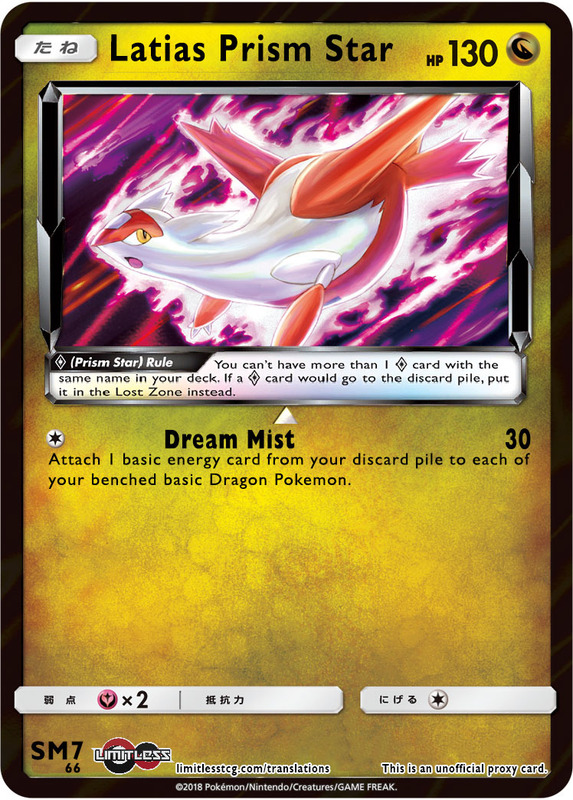 Obviously the more Rayquaza GX you can get benched before using Dream Mist the better, but if you open with Latias or find yourself in a situation where you’re short of the knockout with Rayquaza GX against something it can make sense to go into Latias to accelerate some Energy then, even if it’s only for 1-2 Energy accelerated. As much as I would love to play Fighting Fury Belt to help Rayquaza GX with its frail HP (yeah, even 180 HP feels frail these days), I think the reality of the deck is that it needs to play Choice Band to hit the knockout math it needs more consistently. With Fighting Fury Belt you just don’t hit the knockout numbers you need consistently enough. In most situations you need Choice Band to scrape out the OHKO. The most recent card that I’ve started to really consider a staple for the deck is Pheromosa GX. The primary reason Pheromosa is included in the deck is for its Beauty GX attack. Beauty GX helps you get that last big OHKO without having to extend too hard for it. If your opponent is down to 2 prize cards remaining, you will do 200 damage with Beauty GX, which can be boosted to 230 with a Choice Band, which will be good to OHKO all of the relevant Pokemon in the meta right now. The reason this is important is because your damage output with Rayquaza GX can fall off significantly after your 2nd Rayquaza GX goes down. At that point you will have lost six Energy from your field (between two attacking Rayquaza GX), and it can be rough to get back to the six Energy you may need to get the final knockout. With Pheromosa GX, you can change the equation to only needing two Energy in play to get that final knockout. Fast Raid is also useful. If you’re playing against a deck that can’t OHKO, you can sometimes find yourself in situations where it makes sense to jab your opponent with Fast Raid to setup the knockout math for Rayquaza GX. You can also steal some games every now and then by taking some donks with Fast Raid. Remoraid and the Corner Rockruff are the two main Pokemon that you will be able to donk. Who knows, you may even be able to donk a Bubble Froakie, I would imagine that would be very satisfying to do. The last essential component of the deck is some means to remove Parallel City from play. You want to have the maximum amount of bench slots available so that you can get multiple Rayquaza GX benched and powered up. If Parallel City is in play, you might get locked out of being able to get more Rayquaza GX into play and setup. Once you’ve got your Pokemon benched and your Field setup, Parallel City isn’t that annoying to the deck as you can then just discard your Tapu Lele GX’s or some heavily damaged Pokemon from play when your opponent plays it. It can still be a little annoying in denying you bench slots to play down Tapu Lele GX to search out Supporter cards, or your Oranguru to get more draw. The two primary counters are of course Field Blower and alternate Stadium cards. Right now I still keep Field Blower in the deck to have the option of removing Tool cards from my opponent’s Pokemon. The Stadium Card I’ve been playing in the deck is Devoured Field. It adds 10 damage to Dragon Pokemon allowing you to hit 190 damage with six Energy, or five and a Choice Band, making it a little bit easier to knockout Buzzwole GX’s. Tapu Koko GX provides you an attacker that you can power up by playing it from your hand onto your bench and moving Energy to it from your other Pokemon. Tapu Thunder GX can be used for a OHKO at some point in the game against some decks, but even Sky-High Claws can be a good attack. You can combo Sky-High Claws with a Latias Prism Star attack for some 2HKOs. As you already play 7 Lightning Energy, you can fit Xurkitree GX into the deck, who is one of the best Lightning type Pokemon cards in the game right now. Lightning GX is a strong power play to start a game. Not only does it increase the number of prizes your opponent will need to win the game, but if you put the opponent’s only Supporter out that they have in their hand into their prizes they will probably lose the game from dead drawing. Xurkitree is a good attacker against anything that relies heavily on Special Energy. Most people have some counter these days in their Zoroark GX deck, whether it be basic Grass Energy to attack with Golisopod GX or Garbotoxin to shutoff the Ability, so relying on Flashing Head for easy wins isn’t a strong strategy to pursue in the current meta. By playing Ultra Beast in your deck, you open yourself up to the ability to play Beast Ring in the deck. I think you will want to include 2-3 Ultra Beast in your list if you want to go this route. Beast Ring gives you another means to accelerate Energy onto your field, which can help you get the Energy you need to hit the damage numbers you’re going to be looking for in the mid and late games. My current Beast Ring build plays Xurkitree GX and Pheromosa GX for its Ultra Beasts. Of course Beast Ring can’t accelerate to your Rayquaza GX, but you can in a round about way by using Energy Switch. I actually like Energy Switch on its own as well, as you can go the other way, and accelerate to something else with it. For example, you could use Stormy Winds to accelerate an Energy with Rayquaza GX and then Energy Switch it to your Pheromosa GX. Playing Beast Ring in the deck really opens up your Ultra Beast as attackers, especially Xurkitree GX, who needs three Energy to attack. This can give the deck some more versatility in how it approaches some matchups. You’re going to be discarding a lot of cards early game with Stormy Winds, so if you’re discarding key Supporter cards like Guzma that you will need at the end of the game, you can use Pal Pad to get them back. I really like cutting down from 4 Guzma to 3 and fitting in the Pal Pad in its place. Like the majority of Big Basic decks, players will try to pair it with Garbodor BKP as well. The general idea is that you’re going to be the quickest deck in format, so you just want to prevent the slower decks from being able to catch up through their Abilities by hitting them with a turn 2 Garbotoxin that they will have to play around. It does add a level of inconsistency to the deck (although really not a lot), but it can greatly lower the ceiling of other decks in the format if they’re unable to find their answer to Garbotoxin. Right now it seems like Zoroark players are split between 2-3 Field Blower, Malamar players are at 2, and Buzzwole players are at 1. Adding Garbodor to the deck also takes away your crippling weakness to Hoopa SLG and makes that a non-issue. As you’re playing a Dragon type Pokemon in Rayquaza GX you can use Mysterious Treasure for additional search. You can use Mysterious Treasure to search out Rayquaza GX, Latias Prism Star, and your Tapu Lele GX. So far, I haven’t felt too much of a need for additional search beyond the standard four Ultra Ball in straight versions of the deck. I think Mysterious Treasure makes most sense in the Garbodor variant of the deck as you have more to setup, so more search cards help. I’ve been messing around with Mew as an option in the straight variant of the deck. With it, you can copy Latias Prism Stars’ attack to accelerate Energy, accelerating not only to your Rayquaza GX, but also to your Latias Prism Star for a greater overall Energy gain. With the return of Acro Bike, we get access to it as a draw Item for this deck. Acro Bike is pretty solid as it helps you run through your deck a little quicker, adding some consistency, and it also helps you get Energy into your discard pile for Stormy Winds. I know I definitely feel much better about using Stormy Wind when I know there is already an Energy in the discard pile. The downside to Acro Bike is that the deck is already so destructive with discarding resources from Stormy Winds that Acro Bike can sometimes compound the problem, granted it’s nowhere near as bad in that department as Stormy Winds and most of the time the discards aren’t that big of a deal or even helpful. This deck discards important resources like crazy, so the day may come where you need to bring resources back from the discard. I’ve greatly favored Super Rod for my builds of the deck. I’ve found in addition to wanting to bring Pokemon back, I also typically will want to bring some Energy back for late game Max Elixirs and manual attachments. I’ve seen Wishful Baton floated in this deck, but I have two clear problems with this card in the deck. The deck too often finds itself relying on Choice Band to hit the damage it needs for a OHKO. Field Blower counts are significant enough that Wishful Baton probably won’t be effective, just as Exp. Share was rarely successful in formats with Tool removal. The effect is obviously great when it triggers as it conserves the Energy on your field, but I think the amount of successful Wishful Batons you have will be few and far between, and even then, if you don’t take a knockout because you had Wishful Baton attached instead of a Choice Band, conserving that Energy on your field won’t do you a whole lot of good if you fell behind in the tempo game. Shining Genesect is your vaunted Hoopa killer. For the low cost of roughly half the Grass Energy in your deck, you can hit for 130 damage, good to OHKO a Hoopa. While it may seem a little absurd when put in those terms, it’s actually easier done than said for this deck to get it powered up, and between Shining Genesect and Oranguru you should have just enough outs to power through the Hoopa’s in the Yveltal BREAK deck from the NAIC. Here are the lists for the three variants of Turbo Rayquaza that I’ve tried in my testing so far. There may be more variants, but these are the versions I’ve built based on my thoughts on the essential and optional card choices discussed above. Of these three lists, I like the Beast Ring variant the least. Beast Ring is fairly inconsistent, you will typically only have a one turn window to use it in most games, and your primary attacker can’t be powered up with it. If the deck is to be successful, I think it’s going to work at weakening other decks by shutting off their Abilities, as I don’t think without that it can stand toe to toe with the other top tier decks of the current Standard format. In the next section, I go over some of the issues that I see for the deck. The first thing that people will look to when defending Turbo Rayquaza is point to Takuya Yoneda’s win with the deck. The win is important in the sense that it shows us that Rayquaza GX can be the centerpiece of a winning deck. However, it is mostly irrelevant because that tournament was played in the XY-on format that Japan uses, so the deck, card pool, and meta game is far different from what we will see at the World Championship. There are three key things that Yoneda had access to when building his list that we won’t have access to in the BKT-on format. The first is Shaymin EX, which helps make the deck more consistent and explosive. The second is Hex Maniac, which allows the deck to put Ability based decks in check while also giving the deck an easy answer for Hoopa. Then it gets VS Seeker, which helps it recover from Supporters being discarded from Stormy Winds and also gives it the ability to spam Hex Maniac turn after turn. The discards from Stormy Winds make the deck inconsistent. Anyone who has gotten in a significant amount of games with Rayquaza GX probably knows the harshness of the discards from Stormy Winds. I’ve never seen an Ability that you’re reliant on that can so easily lose you the game. There’s just way too many combinations of awful discards that lose you games. Need to accelerate Energy to hit your damage numbers? Well you just milled two Max Elixir. Need Energy for Pheromosa GX to close out the game? Too bad you milled the remainder of your Grass Energy, good luck finding your Super Rod! Oh look, Latias Prism Star just flew to the Lost Zone on that mill. Cool, I just milled a Rayquaza GX, I started one active, prized one and I whiffed the Energy attachment on the Stormy Winds too. I need one more Energy to get the knockout, but I need Guzma to close out the game…and there goes my last Guzma. These are just a handful of the ways I’ve found the deck capable of costing itself games with the discards, and when you sit down and think about it, this all makes perfect sense. We include the cards we do in decks because we find them valuable resources for our decks to function, so naturally having to discard your resources will hurt your deck. This gives the Turbo Rayquaza deck a major inherent flaw. Having to discard 9-12 random cards of your deck every game is painful, and between those milled cards and your prize cards, you don’t have access to almost 25% of your deck for the entire game as you would in any other deck. When Rayquaza GX goes down, you lose 90 damage. Every time a Rayquaza GX that you were attacking with gets knocked out, you lose 90 damage worth of Energy. That is a massive damage hit and can be hard to replace on the very next turn, so what can happen all too frequently is your damage output diminishes to the point where you whiff the OHKO the next turn. This is a much harsher damage loss than we’ve seen. During the 2016-2017 season when Turbo Darkrai was one of the best decks, when Darkrai EX got knocked out you didn’t lose any of your damage output, as your Energy stayed on the field thanks to Exp Share. In that format, there was no Tool removal beyond very niche cards like Beedrill EX, so your Tools stayed safe when you played them down. In the current Standard format, if you try to play Wishful Baton or Exp Share they probably will be removed from play before you get any effect from them. There is a Lanturn coming out in Celestial Storm that has an Exp Share Ability, but I’m not sure how viable or consistent of an option that would be to get setup. You would only be conserving approximately two Energy per a game for each Lanturn you have in play, and in a theoretical multiple Lanturn build, you would only conserve 1 if the Rayquaza GX had two Grass attached. The Pheromosa GX that I’ve included in my lists certainly helps break past this problem, but sometimes you struggle to get the 2nd Rayquaza GX to hit for enough damage for a knockout, and sometimes you will whiff the OHKO with Beauty GX to finish the game because you didn’t draw into the Choice Band you needed. Where I found the 180 HP the most pronounced was against Ultra Necrozma/Malamar. You can hit for 180 damage with Photon Geyser for only two Energy discarded, allowing you to get by against Rayquaza without too much of a setup. Dawn Wings Necrozma GX also easily OHKO’s Rayquaza GX with Moon’s Eclipse GX, which does exactly 180 damage. Latias Prism Star isn’t as good as you think. One thing I’ve noticed is that Latias Prism Star isn’t as good as I thought it would be. In the early game, there are a few issues I’ve found with it. First, if you whiff the Float Stone, you’re unable to attack with it when you start it. Even if you start it and can get it active, your field may only have a single Rayquaza GX in play in the early game, making the acceleration fairly loss. I found that when I used it in the mid game that it typically was a turn where you lost tempo. Decks like Buzzwole and Malamar are able to take OHKO’s too easily, so if you are stopping to replenish your field with Energy, what often follows is that word everyone loves to hear “Guzma”, and then you fall behind two more prizes. The deck is going to be easy to counter. If push comes to shove, the deck can be teched against well. In particular, Zoroark GX decks will be able to easily tech against it. The tech of choice? Tapu Lele from Ultra Prism. For a single Fairy Energy, you can OHKO Rayquaza GX with Psywave if you have a Choice Band attached and it has three Energy on it, which it will need if it’s attacking. Zoroark decks can easily incorporate Rainbow Energy into their Energy lines to take advantage of this card. A more general tech is Sylveon EX from Generations. For a Double Colorless Energy you can OHKO a Rayquaza GX with Dress Up if you have a Choice Band attached. This makes it so that Sylveon GX can be fit into any deck playing Double Colorless Energy. One cool thing about Sylveon GX is that it isn’t reliant on anything the Rayquaza player is doing, so you can quickly run through a field of Rayquaza with it if they’re unable to OHKO it. Garbodor takes you out with the trash. This deck gets destroyed by Trashalanche. You’re reliant on Items to get you setup, reliant on Tools to get your Pokemon into position and attacking (making for great Field Blower discards), and then you will probably discard a few Items along the way with Stormy Winds. Given that Zoroark GX/Garbodor just won the last two events and doesn’t appear to get weaker headed into the Worlds Format, this seems like a big problem for a deck to have. Mewtwo EVO is a solid attacker into Rayquaza GX. You can 2HKO a fully loaded Rayquaza GX with Psychic as long as you have Choice Band attached for one of the attacks. Latios from Shining Legends can be used in Zoroark decks as a way to maneuver the matchup if you don’t choose to play techs. A single spread from Latios on two Rayquaza GX’s can set up your knockout math. From there, you will be able to finish off the KO with a Riotous Beating from Zoroark GX if you have a Choice Band attached. I found the higher the Choice Band count, the easier the time the Zoroark deck has at taken down the Rayquaza GX deck iwth this strategy. It’s very easy for Malamar decks to get the turn on Rayquaza GX. The deck is pretty defenseless against the Moon’s Eclipse turn, so there is almost always a 3-4 prize swing that a Malamar player is going to be able to pull off against a Rayquaza deck. Before getting into the final section, I should caveat this by saying that I have not tested this concept at all. There just hasn’t been time yet to test everything yet, this is certainly on the list, and I wanted to test the Turbo variants before anything else in this format. Turbo Rayquaza is misdirection and the real home for Rayquaza GX is with Magnezone. Now there are two points of evidence I have for this theory. First, the discards from Stormy Winds are just way too ridiculous. As I said earlier, I’ve never seen a deck find a way to lose games off its Ability like Rayquaza GX does with Stormy Winds before. I just can’t see good players anchoring themselves to a deck with such a bad element of randomness attached to it. Second, Pokemon printed Magnezone in Forbidden Light. Not only did they print Magnezone in Forbidden Light, but they reprinted it in Forbidden Light. Reprinted is the key word here. We already had a Magnezone that accelerated Lightning Energy from BREAKthrough, but it never really saw any serious play because all of the attackers you could pair with it were doo doo. Pokemon went out of there way to say, hey, we need to keep that card in format…almost like they have plans for it. There is already precedent for a Rain Dance style deck using an attacker that scaled damage based on the amount of Energy attached and that’s Blastoise/Keldeo EX. Magnezone/Rayquaza actually has the potential to be much better than Blastoise/Keldeo EX was as the damage scales faster with Rayquaza GX and because you can spread the Energy across your field, only needing three Energy on a Rayquaza GX to attack with it. With Keldeo EX, you had to load up your Keldeo EX with 6 or 7 Energy to get your OHKO’s. You have to do the same with Rayquaza GX, but that can be spread across 2-3 different Pokemon as it does not have to be all on one Pokemon to scale your damage upwards. There are three things that make this a strong concept, even within the context of the current meta. This style of deck would allow you to address the concerns over Rayquaza GX’s frailty by allowing you to play Fighting Fury Belt while still hitting the damage numbers you want out of Rayquaza GX. This is one of the better Rain Dance builds you could have against Garbodor. Decks like Magnezone/Dusk Mane Necrozma GX can have a tough time dealing with Garbotoxin because they discard their Energy when they attack. Rayquaza GX doesn’t discard its Energy when it attacks, so you could potentially set up your field Energy wise good enough to last you through the entirety of the game all during a single turn. The deck is relatively N proof. Once you’ve flooded your field with Energy, as long as you have the Energy in play for the next attacker, your opponent will be unable to seriously disrupt you with N.
So this is going to be the hot take that I conclude this article with. Turbo Rayquaza is an okay deck, probably Tier 3 straight up, and then on the lower end of Tier 2 with Garbodor, however, the real Rayquaza deck players need to be looking at is Magnezone/Rayquaza, which appears to have what I think is some clearly top tier power behind it. Thanks for the article, Andrew. Really well written as ever. A quick question if possible – why would you pair Rayquaza Gx with Magnezone over Vikavolt (which can accelerate both lightning and grass)? I think it’s immensely easier to build a consistent deck around Magnezone than it is Vikavolt, as you can do everything you want with a single Magnezone in play, while with Vikavolt, you’re probably going to need to get two online fairly quickly to hit the damage numbers you will need. I also think Magnezone’s ability to setup the field in one turn with Energy that can last you the rest of the game gives it better power, and will make it better able to deal with Garbodor decks. I know ZoroGarb is #1 in my personal deck rankings right now, and it’s probably in a similar place for a lot of other players as well right now. One last thing, with Magnezone, and Vikavolt, is that with Magnezone you can work on incorporating some form of healing into the deck, either Super Scoop Up (like Andrew Krekeler’s Regional winning Blastoise deck from 5 years ago) or Max Potion. You can get away with sacking Energy (or picking them up in the case of SSU) as you can immediately play them down. With Vikavolt, you would be unable to incorporate things like that in the deck. Thanks for that – super detailed and interesting! I honestly forgot this website still existed. I understand life gets in the way, but boy do I wish you put more time into the site. I had this site pinned to my favorites until you started to let it fall off. I’ve been testing out the Rayquaza/Magenzone and I’ve been able to to set up quickly by my second turn since you really only need one magnezone to set up.